It's been said many times that weight loss is actually quite easy, once you get into the swing of things, but that maintaining your new, lower weight is much, much harder. You see it time and time again - people lose weight, feel fabulous for a short time, then rapidly regain most or all of the weight they lost. It's more likely if they followed some extreme weight-loss method and dropped the extra lard super-fast. But no matter how insanely or sensibly the mechanical side of weight loss was approached, the biggest red flag for imminent rebound is ignoring the emotional stuff that lurks beneath the surface in pretty much all of us. Yes, it can be difficult to work through. But it's well worth the effort to be freed from the diet/binge cycle, and to throw off the mental turmoil that goes along with it. I'm floored by the number of people who think they can shortcut this process though, and resolve their weight problems if they can just find the "right" diet or program to follow. It makes me really sad when I see people opt for weight loss surgery as an alternative to figuring out what drives them to overeat. It also makes me mad at the medical "professionals" profiting from this, instead of helping these poor people with the real problem - of which their weight is just a symptom. I know a couple of women who've had gastric banding, so I've witnessed first hand the spectacular failure of the experts promoting this procedure to help patients make real, lasting psychological change. One of these ladies lied outrageously to the psychologist conducting the pre-surgical screening, about her relationship with her parents. She knew what a minefield that was, and simply did not want to do the work that would undoubtedly be required to resolve the painful and complicated issues. She wanted a quick fix, and she wanted it NOW. Post-surgery, she's had to give up eating meat because it gets stuck in her band, but is still capable of eating sweets all day long, especially if they're easily digested things like mousses and custards. Balanced diet? Hmm. The other woman commented to me yesterday that she was exhausted. She's doing an eight-week challenge at her gym (again) and "has to" burn 500 calories through exercise every day. Yesterday morning's effort, beginning at 5:00am, was a spin class, plus 30 minutes on the treadmill, plus a PT session. She's skinny-fat, pale and quite sick-looking. Her parting comment was "I wish I didn't have to do this. I'd rather sit on the couch and eat a family block of chocolate". She's told me before that when she's old, she'll give up worrying about how she looks and eat a family block every day. Healthy attitude? Both women have lost a lot of weight. Neither seems any happier than before, apart from feeling more acceptable to society. I'm certain though, that they don't feel any more acceptable to themselves. Are these successful weight loss stories? I think surgery is a tool, just like anything else. I didn't always feel that way. It's been part of my own evolving views on fitness and what drives people. The bigger issue is that "society" places such a premium on quick results. People just don't want to hear that there's no magic trick. There's physical work, sacrifice, and discipline required. Yes it is a matter of willpower, even when you've got psychological and physiological issues in play. I get yelled at for that periodically. Doesn't make it less true. Don't tell me that you have a medical/psych issue in play and then turn around and say you refuse to give up XYZ. The XYZ is the choice element. That's the piece in your control. Understand that, accept that it's in your power to change. It's interesting that director Kevin Smith lost 60+ pounds about a year after he was booted off a flight for being too large for his seat. At the time, he complained repeatedly that he was just fine. Really? Is that why you turned around and dropped the weight? 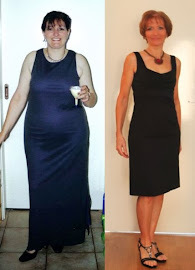 Back on point, weight loss surgery can be an effective tool when used correctly. Just don't expect it's going to do the work for you. Clara is spot on. Having had a sleeve gastrectomy as opposed to a band I have only ever thought of it as a tool. My emotional health has improved considerably with the use of this tool. I am grateful for it everyday. The last twelve months have been some of the hardest in my life and to some extent this tool has saved my life. I love what it has helped me do. I love that I can have the occasional treat too, which used to be accompanied by a massive guilt trip and a huge dose of self doubt. In the whole weight loss game, I'd say, oh about 95% of it is in learning to manage your thinking and your emotions. Learning to change your mind takes some work - but as you and I know, it's worth it! Kerry, I've seen the dramatic result of your surgery and you know I've said to you that if it was the right thing for you, then bravo. You also know that surgery wasn't the "happy ever after" end of the story; that there's still work to do to reach a point where you're at peace with yourself. Liz and I both readily admit that we still have work to do too - the thing is, to be successful you have to be willing to do it. Unfortunately, many people are living firmly in denial that any such thing is necessary. Great post Kek! I emphatically agree that it's all about your 'headspace'. If you can address and resolve your particular issues that brought you to gain weight in the first place, then you'll have a fighting chance of sustaining any type of weight loss and a healthier lifestyle.